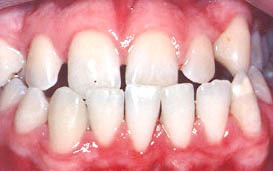 As mentioned earlier, when bacteria are left to accumulate on the teeth, they form deposits called calculus. 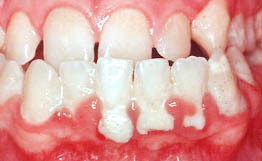 The calculus deposits unfortunately cannot be removed by brushing and flossing. Only a professional can gain access to remove all deposits. The professional cleaning that removes plaque, calculus and bacterial toxins from the root surface is known as scaling and root planing. Removal of the calculus combined with proper oral hygiene will allow the gum tissue to reform a tight healthy seal at the neck of the tooth. The seal will prevent bacterial penetration into the pocket. With the professional cleanings, tissue health and colour will dramatically improve. Gum sensitivity and bleeding will decrease as well. Special hand instruments called scalers and curettes have been developed to remove the calculus in an effective and comfortable manner. The fine curettes come in different sizes and shapes. The instruments are designed so they can be gently teased in to the pockets in order to scrape off the very adherent calculus deposits. If the teeth or gum tissues are sensitive, your dentist can numb the teeth and tissues with local anaesthetic (freezing) to assure your comfort. Scaling and root planing is a meticulous process and may take a number of appointments. A quality professional cleaning will be the first step necessary in establishing your periodontal health. If the periodontal disease is in an advanced stage, an antibiotic may be prescribed along with the scaling and root planing. Irrigation of the infected pockets with an antibiotic or antiseptic solution can be helpful in chasing those bad bugs away during the professional cleanings.